Orbital ATK (NYSE: OA) has been awarded a contract for a second Mission Extension Vehicle (MEV-2). Artistic rendition of an MEV spacecraft approaching a satellite in need of servicing. Image is courtesy of Orbital ATK. Through its Space Logistics subsidiary, Orbital ATK will introduce in-orbit commercial satellite servicing with MEV-1 late this year. The MEV is based on the company’s GEOStar™ spacecraft platform and controlled by the company’s satellite operations team. The MEV uses a reliable, low-risk docking system that attaches to existing features on a customer’s satellite, and provides life-extending services by taking over the orbit maintenance and attitude control functions of the client’s spacecraft. Each MEV vehicle has a 15 year design life with the ability to perform numerous dockings and repositionings during its life span. Ken Lee, Intelsat’s SVP, Space Systems, offered that Intelsat was an early proponent of the potential for mission extension technology. 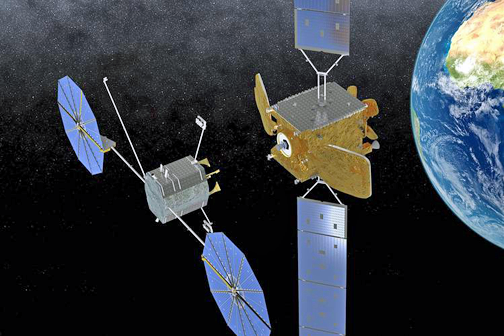 In-orbit life extension, such as that provided by the company's two contracts with Orbital ATK, provides additional flexibility to Orbital ATK's fleet management, allowing the firm to direct capital to new satellites while continuing to generate economic value from satellites on orbit.